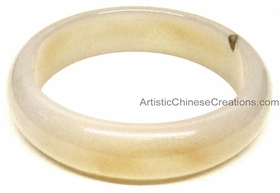 Solid genuine jade - available in the traditional, elegant bangle. Note: Due to the nature of natural stone, each color will vary. Jade is the gemstone most valued by the Chinese. It symbolizes excellence and purity. From high antiquity, jade has been a symbol of all that is supremely excellent and the perfection of human virtues. When we refer to "Chinese Jade" we are speaking of gemstones the Chinese have used for centuries. Chinese Jade comes in many forms, such as: New Jade (Jadeite), Old Jade (Nephrite), Hard Jade, Yunnan Jade (Jadeite), Soft Jade (various), Malaya Jade(Chrysoprase), Honan Jade (Bowenite), Shanghai Jade (Soapstone) and more. Each unique piece carries symbols of good fortune, longevity and abundance.